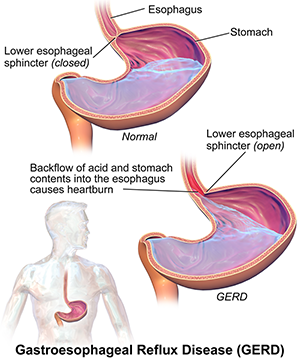 Gastroesophageal reflux disease, or GERD, occurs when stomach acid escapes the stomach and travels upward to an individual’s esophagus. This condition is synonymous with frequent heartburn and affects as many as two-thirds of the adult US population at some point in their lifetime. In less severe or frequent cases, heartburn is usually treatable with diet and lifestyle changes or with medications, many available over the counter. However, severe and/or chronic cases of GERD send as many as five million patients to the hospital per year. Minor symptoms of gastroesophageal reflux disease include heartburn and damage to esophageal tissue, but according to the US National Library of Medicine, can also have less obvious symptoms including “dry cough, asthma symptoms, or trouble swallowing.” If left untreated, serious medical concerns can arise. Esophageal cancers and airway disease are both known complications of GERD. Barrett’s esophagus is another potential complication in which the lining of the esophagus begins to resemble the tissue of the intestine, further increasing the risk for malignancy or cancer. The exact process of how GERD develops in patients is not fully understood, but it is believed to be caused by a weak or overly relaxed lower esophageal sphincter (LES). The purpose of the LES is to prevent food and stomach acid from escaping the stomach; however, in GERD this is not the case. As a leading surgeon specializing in the digestive are, Dr. Michael Feiz has helped countless GERD sufferers, but surgery is always a serious matter. Before surgery can occur, we must provide objective documentation of gastroesophageal reflux. An esophagoscopy is generally the first method of diagnosis. Tissue samples are likely to be taken during this procedure if inflammation is apparent in the esophagus (this can also be referred to as esophagitis). In the event that esophagitis or reflux is not evident, a 24-hour pH test may be ordered by your doctor to provide proof. If, however, the esophagoscopy finds evidence of Barrett’s esophagus, this can be used as objective documentation. Who is Anti-Reflux Surgery Intended For? Patients who do not report a bettering of symptoms despite high doses of the proper medications. Patients already suffering from severe complications of GERD, like Barrett’s esophagus. Patients suffering from severe symptoms of GERD, like asthma induced by chronic heartburn. Patients who wish to avoid indefinite medication for acid suppression. A surgery known as Laparoscopic Nissen fundoplication is currently the standard operation for treating gastroesophageal reflux disease. The procedure basically reinforces the entirety of the lower esophageal sphincter. During the operation, the esophageal hiatus is made narrow by sutures to either treat or prevent a concurrent hiatal hernia. Afterward, the patient’s upper stomach, or fundus, is made to encase the lower portion of their esophagus and secured by stitches. In the rare event that the Nissen fundoplication is either unnecessary or unwanted, a partial version may be performed instead. A Dor fundoplication is another surgery that reinforces the anterior portion of the esophagus while the Toupet fundoplication builds up the posterior portion of the esophagus. However, in most cases, the Nissen fundoplication is the only surgery considered. Many studies suggest that anti-reflux surgery is a strong alternative to medications for acid suppression as surgery reduced acid exposure to the esophagus in addition to greatly reducing pressure on the LES compared to medications. Many patients are able to stop taking related medications after the surgery as well and the rate of patient satisfaction is objectively higher than those who stick to medication regiments. Suffering from Persistent Gastroesophageal Reflux Disease? If you are dealing with painful symptoms of GERD that don’t respond well to drugs or dietary and lifestyle changes, then a procedure may be the best route. To find out more about working with our team of outstanding medical professionals at Dr. Feiz & Associates, call us today at the phone number or reach out via our contact page.